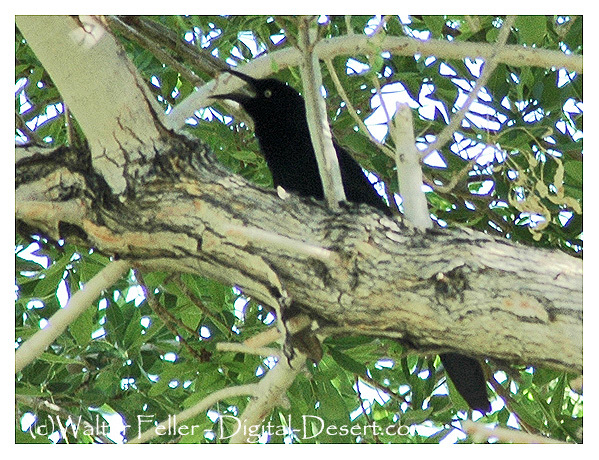 A large icterid blackbird with habitat ranging from Kansas in the northeast and southern California in the west to northwest Peru and northwest Venezuela; the grackle's range has been expanding north and west in recent years. It is common in Texas and Arizona in the southern regions. It is commonly found in agricultural regions and suburban environments, feeding on fruits, seeds and invertebrates. There is a considerable amount of sexual dimorphism in this species. Males reach up to 43 cm (18 inches), including a tail that is almost as long as the body, weigh 230 g, and are jet-black with a violet-blue iridescent sheen to the feathers. Females are significantly smaller at 33 cm (13 inches), weigh 125 g, and are mainly brownish-black, with a pale brown throat and belly.